MURRAY, Patty, a Senator from Washington; born in Seattle, King County, Wash., October 11, 1950; graduated, Washington State University 1972; education volunteer 1977-1984; instructor, Shoreline Community College, Shoreline, Wash., 1984-1987; citizen lobbyist for environmental and educational issues 1983-1988; member, board of directors, Shoreline School District 1985-1989, serving as president and legislative representative for two terms; member, Washington state senate 1988-1992, Democratic whip 1990-1992; elected as a Democrat to the United States Senate in 1992; reelected in 1998, 2004, 2010, and again in 2016 for the term ending January 3, 2023; chairwoman, Democratic Senatorial Campaign Committee (2001-2003, 2011-2013), Committee on Veterans Affairs (One Hundred Twelfth Congress), Committee on the Budget (One Hundred Thirteenth Congress); Democratic Conference secretary (2007-2017); assistant Democratic leader (2017-). Murray, Patty, et al., Nine and Counting: The Women of the Senate. New York: Perennial, 2001. 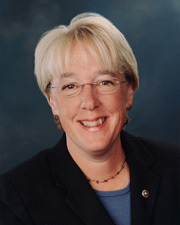 "Patty Murray," in Women in Congress, 1917-2006. Prepared under the direction of the Committee on House Administration by the Office of History & Preservation, U.S. House of Representatives. Washington, D.C.: Government Printing Office, 2006.